Austin, Texas: Last Saturday afternoon A.D. and co. made our way over to the KLRU Austin City Limits television studios, located on the campus of the University of Texas, for day II of consecutive ACL tapings (Friday we caught the Arcade Fire taping, see reviews here, here, and here). But Saturday was the main event — Saturday was Wilco. Now, I don’t know about you, but I’ve been watching this show on PBS since I was a wee lad growing up in Atlanta. Its televised images of Willie Nelson and other Country and Folk legends, broadcasted “live” from the ACL studios, have long been burned into memory. This being so, taking in one of the tightest acts working today (at arguably the peak of their live powers) was no doubt the crowning performance of my time in Austin this go ’round. If anyone in the audience, prior to Wilco taking the stage, was not yet a fan of their new LP, Sky Blue Sky, I’d wager by the end of the band’s hour and half set, that more than a few were fully converted. Sitting (literally) twelve or so feet from the stage, to Nels Cline’s right, gave the new material much more immediacy than I would have expected. While I’d been playing the new jams fairly consistently since its release, I was in no way prepared for the album’s live work up. This was the stuff of Alchemy, and Tweedy led the way. Kotche’s hypnotic, unearthly sense of polyrhythmic instincts, and Nels’ idiosyncratic individual textures cannot be understated. Can you tell I enjoyed it? Not only did the band dig into to the most recent two records, but Yankee Hotel Foxtrot and Summerteeth were both given more than a couple winks. The cacophony in the middle of Summerteeth’s “Via Chicago” left many slack jawed, and rightly so. 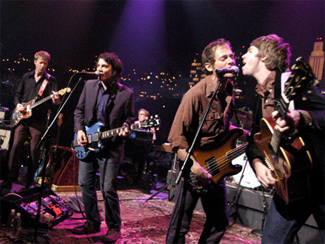 But the most surprising artifact to grace the setlist was the unearthing of A.M’s “Too Far Apart.” Even Tweedy quipped something to the effect of “anyone heard this album?” Unfortunately, while the full band arrangement sounded great, Tweedy missed the his falsetto notes at the song’s end, so don’t expect to catch the song when it airs this November. + Download tunes via eMusic’s 25 Free MP3 offer. + Visit The Hype Machine for additional Wilco MP3s. “Too Far Apart” was the highlight for me at their recent stop here in Madison as well. Surprised the hell out of me. Sounded amazing. Wish I could have made the performance you did…someday. We were standing RIGHT in front of you, on the floor right behind the Nils’ camera guy. my favorite moment on the new album is the urgent guitar solo followed by ‘i have no idea how this happens…’ in you are my face. glad you got to be so close to the wilco! looking forward to the airing. My burning, white hot envy should be palpable across the Internets. Can’t wait for this one to air, and appreciate the preview. I was fortunate enough to catch the boys in Nashville a while back at the Ryman. Best show I’ve ever seen, including a Tweedy solo closer of “Acuff-Rose” with the mic stand behind him, because he wanted to play the song “the way it was meant to be played.” Brilliant. Saw them earlier in the year as well at Chastain Park in ATL in the pouring rain. Soaking wet, listening to Tweedy sing “Maybe the sun will shine today…” The irony was not lost on him. It was great. They were great. We were all great together. Like all of us, I listen to A LOT of music, and I really can’t think of another working band who so represents all the power and majesty that is rock & roll. Gos bless Wilco, indeed. Now, if I could only see them live. dude, don’t be such a tease… hook us up with the whole show! Nick, I think those downloads are studio cuts. I loved going to ACL tapings when I lived in Austin. Do they still give you free beer as you’re walking in? oops, I guess I should have listened to them first before asking for more! Dude, how did you score tix? It’s virtually impossible for the common folk. Damn, blogging has come a far way.